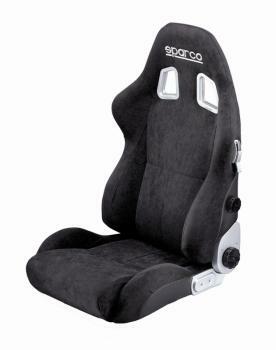 Sparco Tuner Seat - Milano 2 UNIVERSAL - Dezod Motorsports Inc - Home of the automotive performance enthusiast since 2002. One of the most advanced adjustable sport seats ever manufactured by Sparco. The back rest can be reclined to the millimeter and features the exclusive QTS (quick tilt system) technology for rapid return to the upright position. It also features a revolutionary contoured injection molded memory foam and Touring car inspired g-force absorbing side bolsters. Another noteworthy feature is the lumbar adjustment system that ensures proper ergonomics and ultimate comfort in all driving conditions.